While Standing on the Shoulder of Giants was recorded essentially as a three-piece, the Gallaghers needed a full band to tour behind it, so they recruited guitarist Gem Archer and bassist Andy Bell from the awesome shoegazers Ride (who will have at least one Certain Song of their own next year) to permanently replace Bonehead and Guigsy for the rest of the band’s run. In addition, Noel Gallagher decided that he wasn’t going to write every single song, and the songwriting credits on their next album, Heathen Chemistry, were far more democratic. There has been a tiny crack in the window on the previous album, Liam sneaking in his dire “Little James,” but on Heathen Chemistry, the songwriting credits were way more distributed than ever. Noel had six, Liam had three and Archer & Bell had one each. The result was their strongest album since (What’s The Story) Morning Glory? That strength was evident from the lead single, “The Hindu Times,” which sounded and felt like a classic Oasis single: a massive mid-tempo stop with an instantly-memorable guitar hook and a chorus that said nothing and everything at the same time. And as for Noel, he was back in his element, extending the main guitar riff during the solo, layering about 150,000 voices singing “ahhhh” in the post-chorus, and basically reveling in what was clearly a back to basics move after two albums of dicking around. 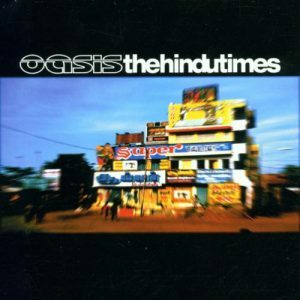 And obviously, at least in the U.K., it was right on time, as “The Hindu Times” was their sixth #1 record in their homeland. Here, in the good old U.S.of A., no self-respecting radio programmer in 2002 was going to air a song called “The Hindu Times,” and it didn’t even chart on alternative radio. Had it be called “Your Rock ‘n’ Roll,” things might have been different.